Listen to Joy Exit's stark new take on the traditional American folk song "Where Did You Sleep Last Night", famously covered by Nirvana in 1993. Strokes of cool arabesque backlit by moody synthpop and ambient RnB... Now on YouTube and Bandcamp! #newcover #newsingle #wheredidyousleeplastnight #mygirl #blackgirl #inthepines #leadbelly #nirvana #electronicpop #electronicmusic #synthpop #ambient #rnb #cool #arabesque #indiepop #electrorock #dreampop #noir #cinematic #darkpop #folksong #blues #oldsongs #favoritesong For the complete song go to: https://youtu.be/-0bXyvW4UDw 5 months 2 weeks ago. JOY EXIT - XOXO röportaj. https://xoxodigital.com/post/14563/joy-exit 7 months 1 week ago. I will start uploading new videos (excerpts from concerts, live recordings at the studio and more) on my youtube channel. Feel free to subscribe. Thanks. https://www.youtube.com/watch?v=F5hzn3hfsKU 7 months 2 weeks ago. JOY EXIT ep teaser. https://www.youtube.com/watch?v=yqhOBDqrZu8 9 months 2 days ago. ERDEM HELVACIOGLU shared a post. 9 months 2 weeks ago. Erdem Helvacioglu is one of the most renowned contemporary composers of his generation in Turkey. His music has been called “revolutionary,” “groundbreaking,” “luscious and unique,” and “completely arresting and disarmingly beautiful.” He has received awards from the Luigi Russolo, MUSICA NOVA, Insulae Electronicae Electroacoustic Music Competitions and has been commissioned by numerous organizations, from the 2006 World Soccer Championship to the Bang on a Can-All Stars. Helvacioglu is also actively involved in composing for films, multimedia productions, contemporary dance and theatre. He won the “Best Original Soundtrack” award in the 2006 Mostramundo Film Festival, and his film scores have been heard at Cannes, Sarajevo, Locarno, Seoul, Sao Paulo, and Sydney film festivals. Ulrich Mertin’s musical activities cover a wide swath, from classical and contemporary to electronic and club music. He graduated from the esteemed “Hanns Eisler Academy for Music“ in Berlin, Germany, and has worked with composers like Pierre Boulez, György Kurtag, Helmut Lachenmann, Wolfgang Rihm, Brian Ferneyhough and with groups like Ensemble Modern and musikFabrik. With his award-winning Hezarfen Ensemble (the leading contemporary music ensemble of Turkey) he has been influencing and enlarging the Turkish contemporary scene for several years. "Planet X comes into view slowly as the mission approaches. The sonic landscape is bleak at first, with rumblings and undercurrents of dissonance that become more overt as the ship lands and the crew become The Hunted. Low string sounds are manipulated to sound more like hunting trombones, and there is a distinct feeling of a chase with moments of repose amidst a landscape during the piece. What is so surprising about the program is how effective the sounds Helvacioglu and Mertin have chosen are. The approach, chase, torture, self reflection, and transformation are all captured wonderfully with the electronics, guitar, distortions, and drum processing." "Mertin's violin and viola scrape, tinkle and screech demonically like small, hungry creatures clawing their way through your walls. Helvacioglu's guitar sputters like malfunctioning machinery, murmuring and flickering like a mirage. 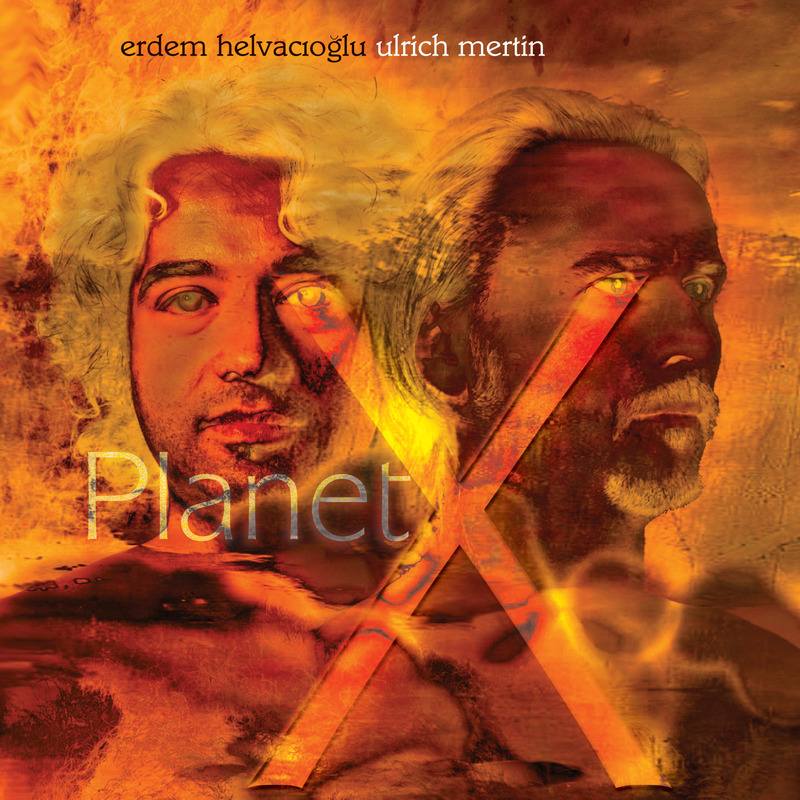 … Planet X is a world where melody--and comfort--in any conventional sense is beside the point, but rhythm and vivid atmospheric textures dominate. Get the 'soundtrack' and hope someone makes a properly good movie to go with it."